There are many more like Carmelito lost in the darkness of sin. Will you help us reach them with the Gospel? I am happily serving the Lord and enjoy helping Pastor Lacsao bring children to Sunday school every Sunday morning. Brother Rick Martin, a Global Baptist Church Planters Partner, is training Filipino pastors such as Moises Lacsao in the Gospel ministry. He was raised in a family of faithful Christians and received Christ as his Saviour at the age of fourteen when his pastor shared the Gospel with him. 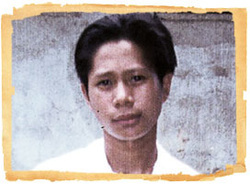 Moises’ brother, Moimar, was also saved and, after enrolling at Iloilo Bible College, encouraged his younger brother to do the same. Moises graduated Bible college in 1998 and worked at Iloilo Baptist Church for about a year. God called Moises to start a church in a village in Northern Negros where he pastored faithfully for more than five years. Then, God burdened Moises’ to start a Baptist church in the town of Bonifacio Cadiz City. Brother Martin recommended Moises to Global Church Planters for monthly support. Our ministry began supporting Moises’ ministry with funds from Northwest Bible Baptist Church in Elgin, Illinois. “After Pastor Moises explained the plan of salvation, he encouraged me to accept Jesus in my heart. I understood that I am a sinner and received the Lord as my personal Savior. For two weeks after that, it was hard for me to understand about going to Heaven after we die. I again asked Pastor Lacsao for assurance. He showed me John 10: 28-29 and John 14: 1-4. After he explained the verses, I understood that Jesus rose from the dead and that when I die, I will be with Him in Heaven. The next week, February 20, 2006, I chose to follow the Lord in Believer’s baptism. The power of the Word of God changed Carmelito’s life and gave him assurance about his eternal destiny. His transformation proves that the Gospel of Christ “…is the power of God unto salvation to every one that believeth…” (Romans 1:16). God used Moises to bring Carmelito Paner Jr. to our precious Savior.